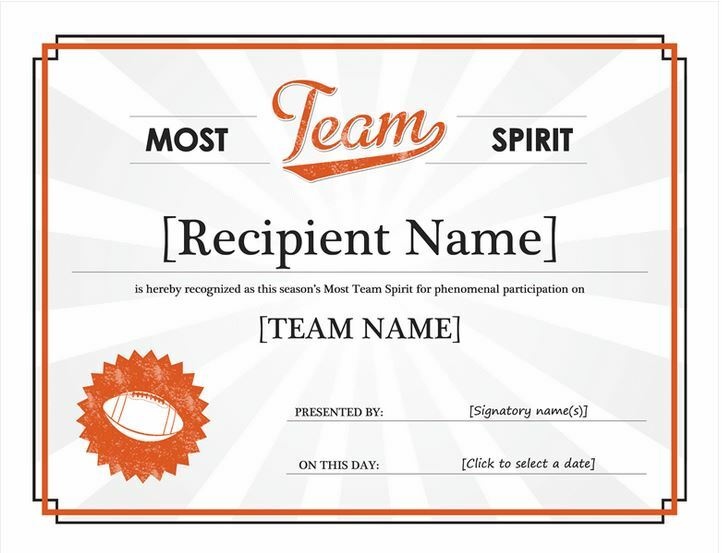 For the high school or college sports coach who would like to have a fast, easy way to get the Team Spirit Award certificate, Microsoft has a template for it ready to use. The template is available for free on this page and is customizable, easy to use and downloadable right here. By customizable, you can alter the text according to the sport for which the Team Spirit Award certificate is to be presented. You may also add a star to indicate, for instance, that this particular Team Spirit Award certificate is for school use only. Another blank space, where the name of the sport is typed. At the bottom left is a symbol of the sport; at the bottom right are two lines with the words “Presented by” and “on this date” in all-caps serif type, on which are typed the name of the presenter (or presenters) of the award and the date of presentation. To download the Team Spirit Award template, simply click on the “Download” link located on this page. Reward the most spirited member of your squad with the Team Spirit Award. Download the Team Spirit Award template for free courtesy of PrintableBrackets.net!